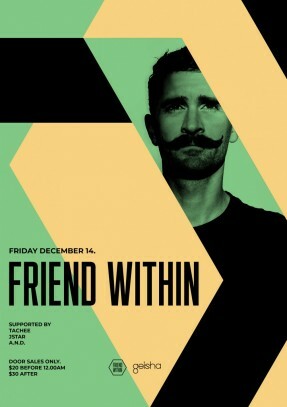 Friday December 14 we welcome Friend Within! With releases on DFTD, Rinse, Dirtybird, PETS, Hypercolour, Method Records, a Radio1 Essential Mix, Diverse DJ support from the likes Pete Tong, MistaJam, Derrick Carter, Annie Mac, Oliver Heldens, Eats Everything and Carl Cox, plus a wealth of remixes for the cream of modern music talent under his burgeoning belt, Friend Within is one producer that’s proved consistently difficult to ignore since bursting onto the scene in early 2013. A ‘producer’s’ producer – the ‘Within’ has spent the last 4 years consistently delivering what is technically known as ‘bangers’ from early EP’s such as The ‘Renegade EP’ released on Method to the twisted Hypercolour release ‘The Underground EP’. Always one to shy away from genres, lanes and boxes, the mysterious Friend Within just wants to make House Music…that’s it. 2014 saw a notable collaboration with Disclosure on ‘The Mechanism’ soon followed, and seemingly outlined Friend Within as the go-to-guy for underground party music that’s licked with that commercial edge: a fact proven by Disclosure inviting him to support them on their biggest ever UK headline shows to date. With further support coming from a huge range of publications including RA, XLR8R, Dancing Astronaut and Trap Magazine to name just a few, Friend Within took his career to new heights with the launch of his very own imprint ‘He Loves you’- a culmination of an incredibly varied back catalogue that has underpinned his unique and genre-blurring take on house music – and oversaw its debut release for the aptly named ‘The Label’. The launch of ‘He Loves You’ also coincided with a debut headline sell out tour of the UK for ‘No Friends Within’ – a concept that took in five cities in five days with sets that lasted five hours and more. With a touring diary that has covered The Warehouse Project, Chibuku, XOYO, We Are FSTVL, Creamfields, Parklife, Fabric plus key European cities and festivals, Friend Within has also demonstrated his massively rising popularity with tours of Australia and the USA. Counting performances on the heralded party that is The Holy Ship! and Mexico’s EDC festival. Fast forward to 2017 and recently having released ‘Make Me Feel’ (Dirtybird) and the quirky ’Get Dumb’ (DFTD) Friend Within is showing no signs of slowing down in momentum with his latest release with Kideko ‘Burnin’ Up’ (Rinse) gaining huge support at Radio1 from Danny Howard / MistaJam / DJ Target plus a rather exciting project / concept in the making for release later in the year that will involve a lot of amazing music…watch this space.! As Always discount Cocktails until 12.